Shirley is a finance professional with over thirty-five years of broad and diversified experience in the nonprofit, public accounting, and financial institution sectors. She has significant experience in financial reporting and analysis, compliance, budgeting, risk management, IT management, human resources, payroll, and employee benefits. 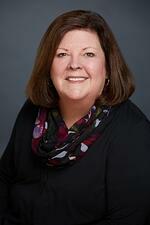 She is an expert in evaluating and improving processes to strengthen internal controls and compliance. Prior to joining CFO Selections, Shirley served in positions as the CFO for Clean Energy Works dba Enhabit and the Director of Finance and Administration for Meals on Wheels People, managing annual budgets of between $4M and $10M. She also previously served as a Senior Manager with Moss Adams, managing the nonprofit, college and university, and financial institution audits and consulting engagements. She was a recognized leader in the firm’s nonprofit practice. Earlier in her career before entering the accounting industry, Shirley enjoyed a successful tenure in the financial institution sector as Vice President in credit review, with additional experience in commercial real estate lending, receivable financing, and operations. 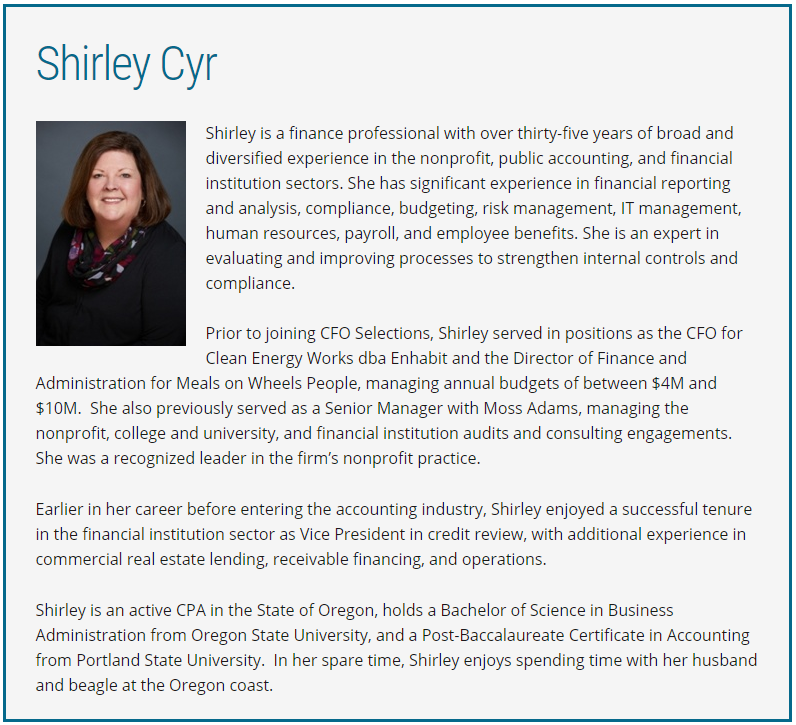 Shirley is an active CPA in the State of Oregon, holds a Bachelor of Science in Business Administration from Oregon State University, and a Post-Baccalaureate Certificate in Accounting from Portland State University. In her spare time, Shirley enjoys spending time with her husband and beagle at the Oregon coast.